Today was another fantastic day on the water, as over the course of four hours we saw six different marine mammal species. First off, we saw the California sea lion (1) that has been hanging out just outside of Friday Harbor. Next, up by Patos Island, we found ourselves surrounded by dozens and dozens of harbor porpoise (2). We shut off the engines and it was so peaceful that we could actually hear them breathing as they came to the surface - so cool! On our way over towards East Point we saw a few harbor seals (3) and Steller sea lions (4) in the water, and then at the haul out there were about a dozen Stellers and a couple hundred harbor seals. Perched right on the rocks with them again was an adult bald eagle. As we cruised down Boundary Pass we were really pleased to find a nice group of Dall's porpoise (5), a species we haven't seen too much of this spring. They were zipping through the water at top speed, sometimes surfacing two or three abreast and kicking up spray into the air. 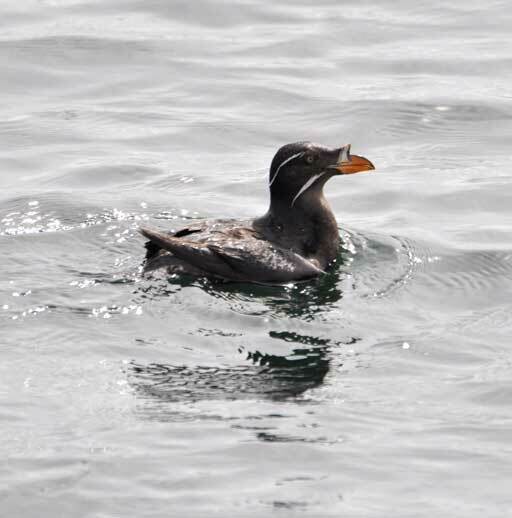 We had several of them right off the bow when all of a sudden we veered away. Why were we abuptly leaving such a cool encounter? There could only be one reason - orcas! 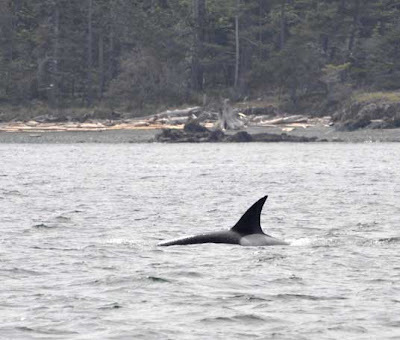 Indeed, the captain had gotten the call we had been hoping for, that another boat had picked up some killer whales (6). 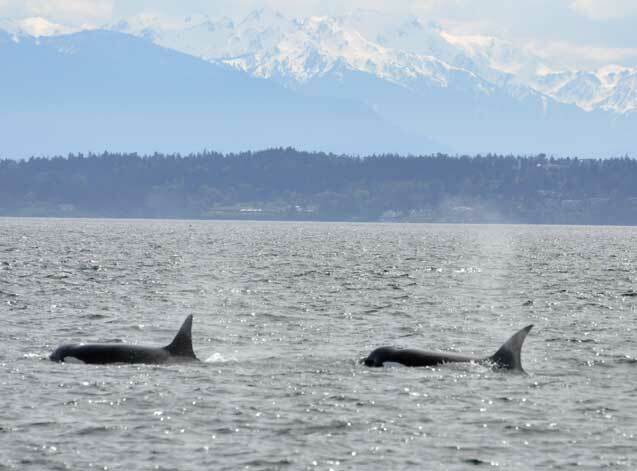 It was late in our trip but we had just enough time to run at top speed over to Haro Strait and meet up with a pair of transients. It turned out to be the same two females that were traveling together a few days ago - T124C and CA58. CA58 is actually a California transient, so it is very interesting to have her up here hanging out with these transients! (Some of you may remember the mystery whale we saw last month with male T103 that I posted about here - turns out that was CA58 as well.) I wonder what kind of relationships these two females have? Above is T124C, who is an 18 year-old female that is known for traveling apart from her family by herself. Below is T124C on the right and CA58 on the left, with Vancouver Island the Olympic Mountains in the background. Happy Mother's Day Mom, and to all moms! Glad the weather's changed for the better for you Monika, enjoyed the photo's today, all that sun! I am a biologist working on a habitat restoration project for Rhinoceros Auklets. Many of the volunteers never get to see these mysterious birds and it helps to share photos with them. We would love to add your photo to the gallery on the restoration site with your name and copyright. Thank you and let me know if we may share your beautiful photo.